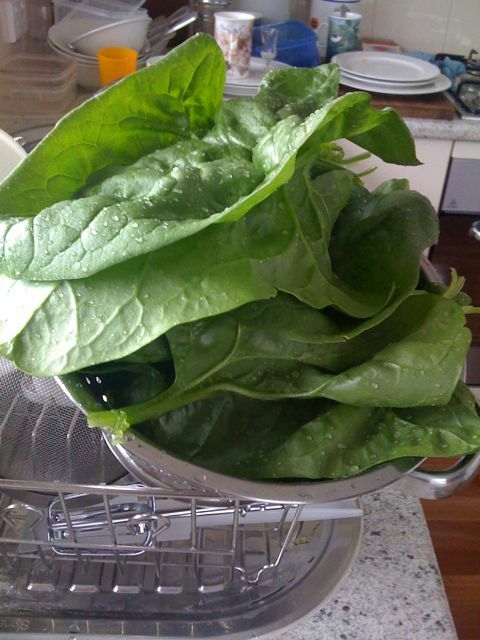 Here is my first spinach harvest of the year! I am treating my spinach in the same way as my bol choi & mesclun lettuce, harvesting what I need instead of uprooting the whole plant. Hopefully that’ll mean I can harvest more over a longer period. This spinach I think is the English type, with smooth arrowhead leaves on thin stems, and the leaves tend to lay against the ground instead of sticking up straight. This is destined to be in a pasta sauce with cream & mushrooms! Yummm. This entry was posted on November 18, 2008 at 5:51 pm and is filed under gardening, iphone posts, veggie patch. You can follow any responses to this entry through the RSS 2.0 feed. You can leave a response, or trackback from your own site. That’s nice looking spinach you grew. I like my spinach uncooked in a nice big garden salad. I think I have an aversion to cooked spinach because I remember being forced to eat it as a kid. I plant my spinach in the fall and cover it with leaves to protect it from our winters. It usually survives and gives me the earliest possible spring spinach. Where are you from Tom? This is my first season with my veggie patches, so I will be doing some experimenting with planting times & getting to know my climate. I think, since we hardly get frosts usually, if I plant the spinach in Autumn & perhaps cover with plastic or something at night I should be able to harvest some early too!